7. YU HUANG. "STUDY OF REGULATED CELL DEATH IN TWO SYSTEMS: PD-1 IN NATURAL KILLER CELLS AND RIP3 IN NEURONS. "The University of Texas. 2018. 8. Olga Almacellas Rabaiget. "Caracterització funcional de LOXL2 en el rabdomiosarcoma alveolar. "University of Barcelona.2018. 12. Yazhong Ge, Qing Gao, et al . 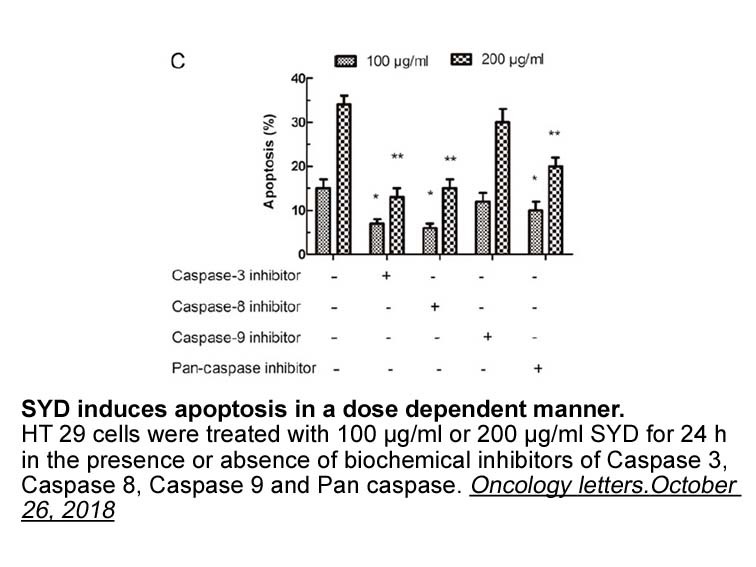 "Su Yang Decoction induces human colon carcinoma cell apoptosis by activating caspases." Oncology letters.October 26, 2018. 15. Santi Rello-Varona, Miriam Fuentes-Guirado, et al. "Bcl-xL inhibition enhances Dinaciclib-induced cell death in soft-tissue sarcomas." bioRxiv. 2018 August 27. 16. Michael Abrams. "Self-repair and Sleep in Jellyfish." California Institute of Technology.2018. 20. Alexander William David Binks B.Sc. "The role of immunogenic cell death in oncolytic herpes simplex virus-1 infection of cancer cells." University of Glasgow.2018. 25. Qianqian Zhang,Wanqiu Huang, et al. "Saikosaponins with similar structures but different mechanisms lead to combined hepatotoxicity" arXiv preprint. 14 May 2018. 40.Heather Koehlera, Samantha Cotsmirea, et al. "Inhibition of DAI-dependent necroptosis by the Z-DNA binding domain of the vaccinia virus innate immune evasion protein, E3." Proc Natl Acad Sci U S A. 2017.August 31. 57.Ardeshir Ariana,Faculty of Medicine, et al, "Dissection of TLR4-induced necroptosis using specific inhibitors of endocytosis and p38 MAPK." University of Ottawa. 2017. 59. Faculty of Medicine University of Ottawa,et al. "FoxO3a signaling promotes the inflammatory response during Salmonella Typhimurium infection. "University of Ottawa, 2017. 60. Weigert, Melanie. "Investigating the role of programmed necrosis in oncolytic adenovirus-induced death." university of glasgow.2017 May 01. 61. Mohammed A. Alamri. "Syntheses and Evaluations of Bicycloheptylamines and Cyclohexylamines as Sigma-2 Receptor Ligands and Their Potential as Anticancer Agents." University of the Sciences in Philadelphia.2017. 72.Katey J. RAYNER, Terrence David RUDDY, et al. "IDENTIFICATION AND TREATMENT OF (52) U.S. Cl.VULNERABLE PLAQUES." US Patent App. 15 ,2016. 80. Boyd Tressler, Andrea Michelle. 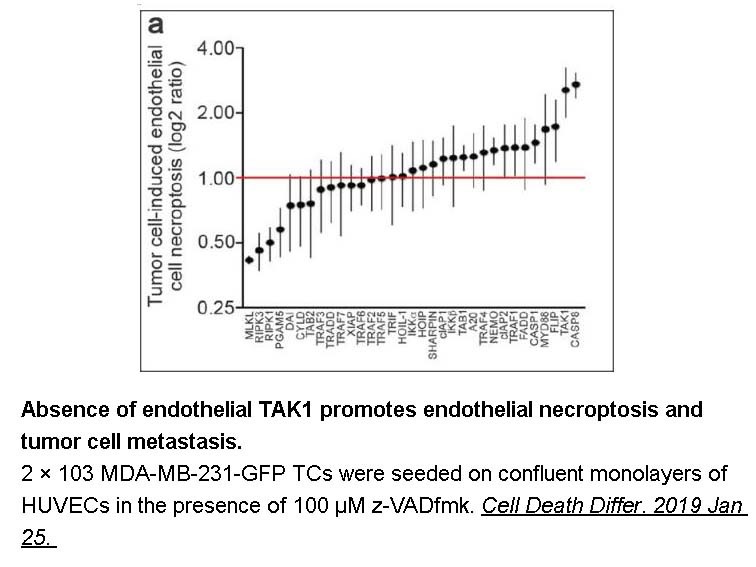 "Mechanisms of Extracellular Nucleotide Accumulation During Regulated Cell Death in Tumor Cells. "rave.ohiolink.edu,May 2016. 81.Hsieh Y Y, Chou C J, et al. "Repositioning of a cyclin-dependent kinase inhibitor GW8510 as a ribonucleotide reductase M2 inhibitor to treat human colorectal cancer[J]." Cell Death Discovery, 2016, 2. 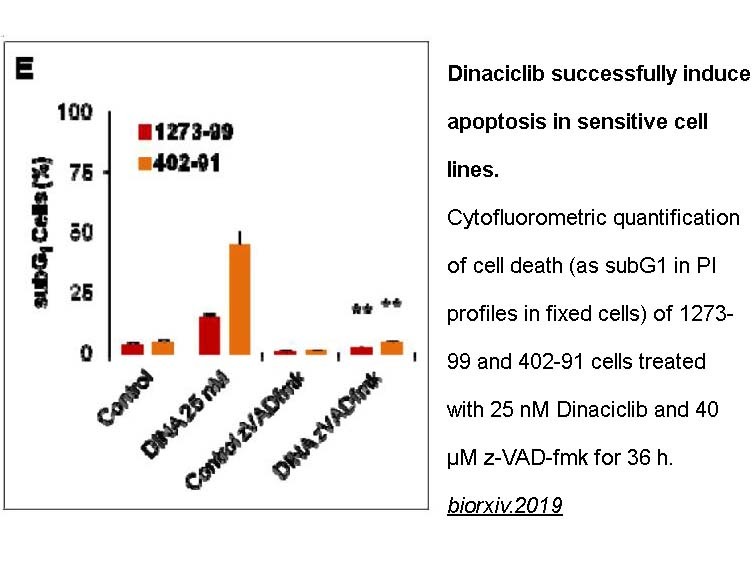 Z-VAD-FMK inhibits apoptosis by inhibiting the activation of CPP32, which presumably blocked the process by interfering directly with the processing of CPP32. Z-VAD-FMK dose-dependently inhibited T cell proliferation mediated through the co-stimulation with anti-CD3 and anti-CD28. Z-IETD-FMK was less effective at 25 and 50 μM, but inhibited T cell proliferation at the 100 μM concentration. The right ear swelling degree, weight differences and thickness between two ears in the 1.25 mML Z-VAD-FMK group were significantly lower than those of the negative control (NC). The levels of INF-γ and IL-2 in the ear skin lesions, the mean intensity of BrdU in T lymphocytes, and the percent of activation markers-positive T lymphocytes were all lower than those of NC.
. Slee EA1, Zhu H, Chow SC et al. Benzyloxycarbonyl-Val-Ala-Asp (OMe) fluoromethylketone (Z-VAD.FMK) inhibits apoptosis by blocking the processing of CPP32. Biochem J. 1996 Apr 1;315 ( Pt 1):21-4.
. Lawrence CP1, Chow SC. Suppression of human T cell proliferation by the caspase inhibitors, z-VAD-FMK and z-IETD-FMK is independent of their caspase inhibition properties. Toxicol Appl Pharmacol. 2012 Nov 15;265(1):103-12.
. Li YY, Yan CL. Inhibition of elicitation of allergic contact dermatitis by topical use of Z-VAD-FMK, a broad caspase inhibitor: experiment in mice. Zhonghua Yi Xue Za Zhi. 2012 Jul 24;92(28):1992-6. 1. Suppression of human T cell proliferation by the caspase inhibitors, z-VAD-FMK and z-IETD-FMK is independent of their caspase inhibition properties. Toxicol Appl Pharmacol. 2012 Nov 15;265(1):103-12. doi: 10.1016/j.taap.2012.09.002. Epub 2012 Sep 12. The caspase inhibitor Z-VAD-FMK exhibits immunosuppressive and anti-proliferative activities in T cell without inhibiting the activity of caspases 8 and 3, where it inhibits NF-KB, the expression of CD25 and FasL-induced apoptosis. 2. [Inhibition of elicitation of allergic contact dermatitis by topical use of Z-VAD-FMK, a broad caspase inhibitor: experiment in mice]. Zhonghua Yi Xue Za Zhi. 2012 Jul 24;92(28):1992-6. 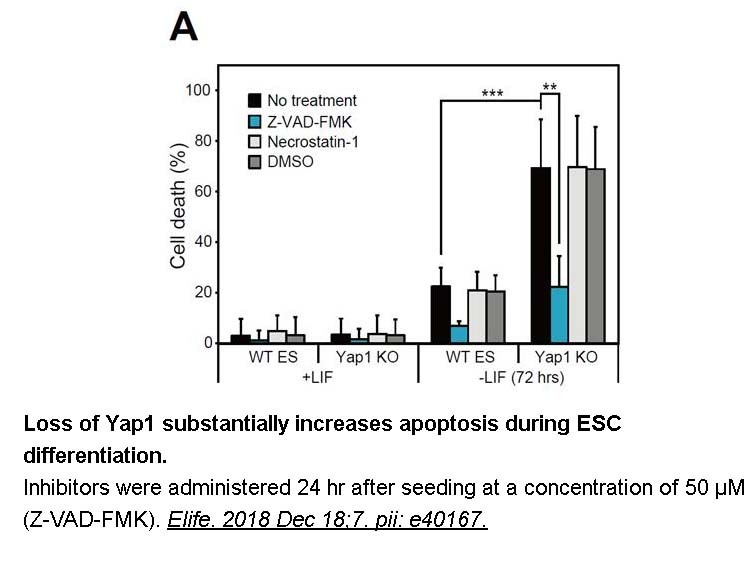 The effects of Z-VAD-FMK, a caspase inhibitor, on T lymphocytes and the elicitation of murine ACD were investigated. 3. Radiation-induced cytochrome c release and the neuroprotective effects of the pan-caspase inhibitor z-VAD-fmk in the hypoglossal nucleus. Exp Ther Med. 2014 Feb;7(2):383-388. Epub 2013 Nov 20. 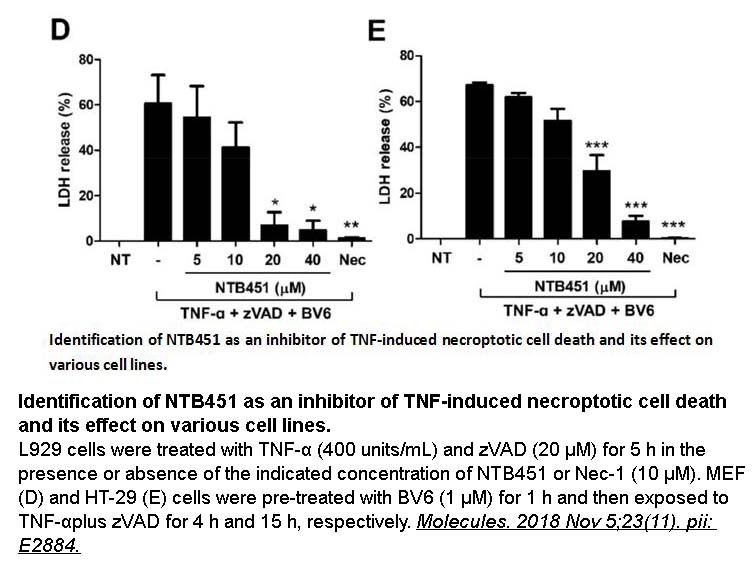 Intracerebroventricular administration of Z-VAD-FMK, a caspase inhibitor restricted by blood-brain barrier, to post-radiation rats resulted in reduced numbers of TUNEL-positive cells in the hypoglossal nucleus, suppressed expression and activation of caspases 3/8/9 and decrease appearance of cytochrome c in the cytosolic fraction. 4. 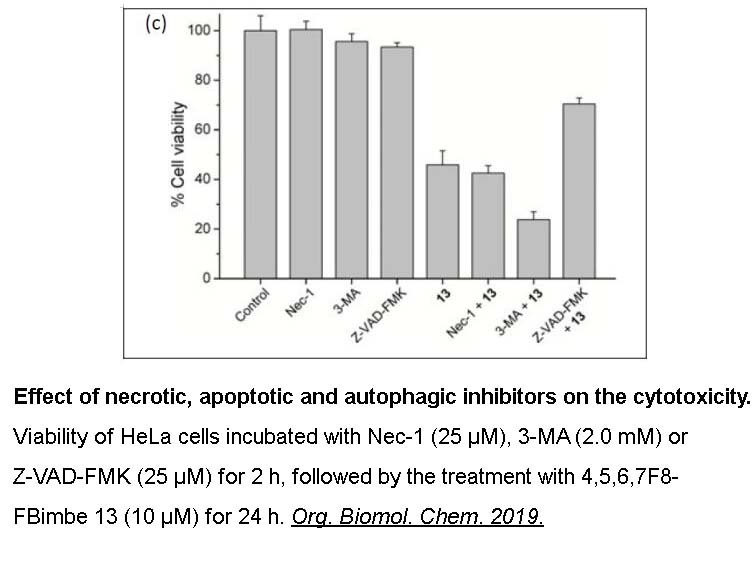 Cinnamaldehyde-induced apoptosis in human hepatoma PLC/PRF/5 cells involves the mitochondrial death pathway and is sensitive to inhibition by cyclosporin A and z-VAD-fmk. Anticancer Agents Med Chem. 2013 Dec;13(10):1565-74. Z-VAD-FMK is a caspase inhibitor that inhibits mitochondria-related apoptotic effects induced by CIN. 5. Intracochlear perfusion of leupeptin and z-VAD-FMK: influence of antiapoptotic agents on gunshot-induced hearing loss. Eur Arch Otorhinolaryngol. 2011 Jul;268(7):987-93. doi: 10.1007/s00405-011-1487-0. Epub 2011 Jan 19. Early direct infusion of Z-VAD-FMK, a caspase inhibitor, into cochlear leads to accelerated hearing recovery and reduced hair cell loss in pigs suffering gunshot noise-induced trauma. Z-VAD-FMK, an inhibitor of ICE-like proteases, inhibits apoptosis in THP.1 cells induced by diverse stimuli1 and Fas antigen-induced apoptosis in Jurkat T-cells2. It inhibits apoptosis by blocking the activation of proCPP32 into its active form, rather than by preventing the proteolytic action of CPP32 directly. Z- VAD-FMK inhibits the formation of large kilobasepair fragments of DNA induced by diverse stimuli. 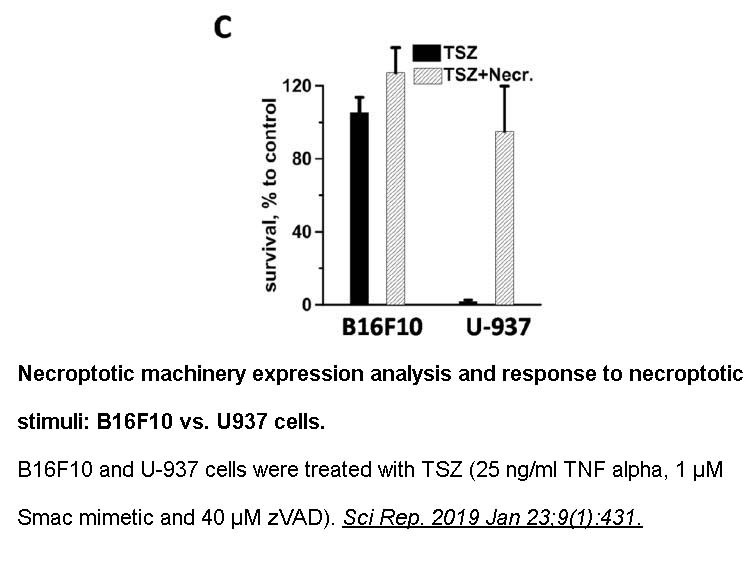 Z-VAD-FMK had little or no effect on STS-induced necrotic cell death suggesting that the ICE-like protease activity was not involved in necrosis3. Z-VAD-FMK almost completely inhibited the formation of large kilobasepair induced by all four stimuli. 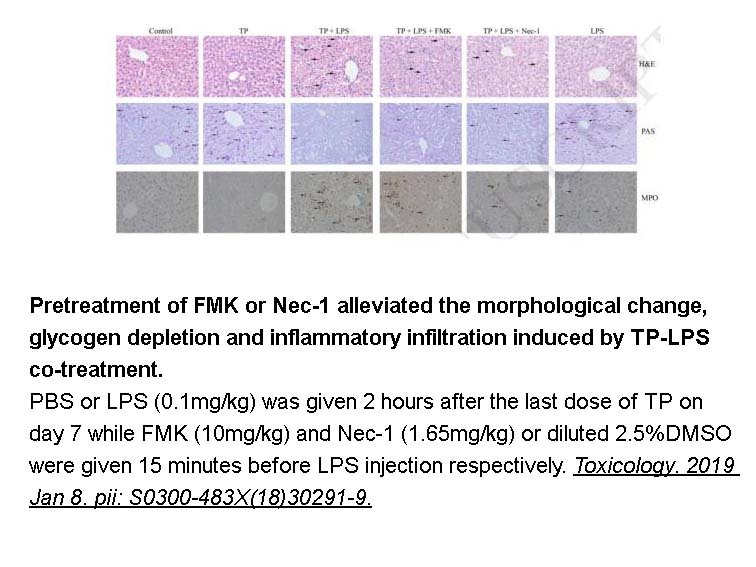 Similarly Z-VAD-FMK almost completely inhibited the enhanced formation of large kilobasepair fragments induced by thapsigargin or cycloheximide in the presence of TLCK, in good agreement with its ability to inhibit apoptosis induced by these treatments. These stimuli also induced internucleosomal cleavage of DNA, which was inhibited by Z-VAD-FMK. These results suggested that an ICE-like protease(s) acts at a stage prior to the formation of large kilobasepair fragments of DNA3. 1. Darmon, A.J., Ehrman, N., Caputo, A., Fujinaga, J. and Bleackley, R.C. (1994) J. Biol. Chem. 269, 32043-32046.